My translation of a fantabulous poem by Charles Baudelaire, taken from his Les Fleurs du mal (1857). The poem is written according to an unusual structure known as a pantoum, which apparently originated in Malaysia. The illustration of the poem is from at least twelve years ago. Desolate waltzes and languorous reeling! The sky’s like an altar, both mournful and fair. A soft heart that shrinks from the void’s endless stare! The sun has now drowned in its blood that’s congealing. Of the radiant past each last vestige is stealing! Your memory as in a monstrance I bear! 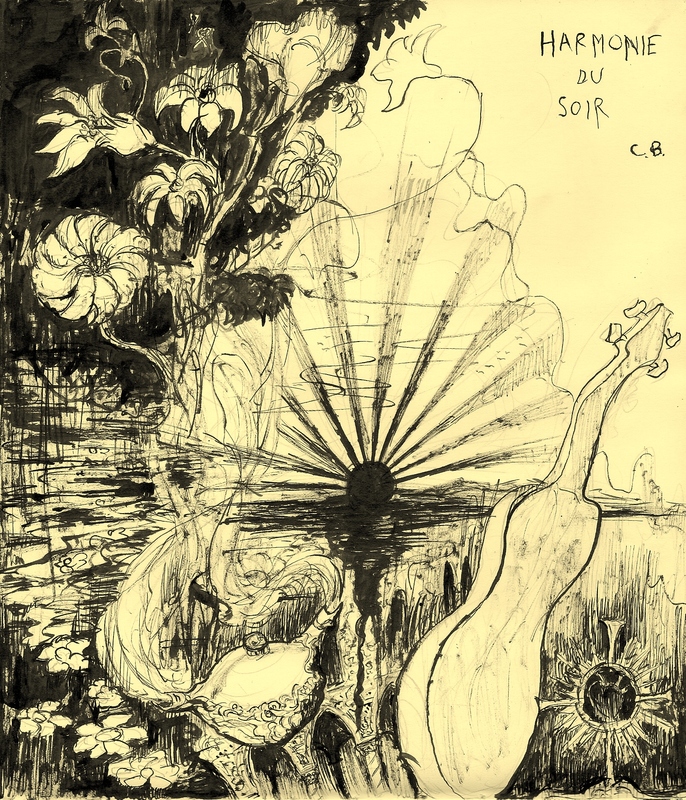 This entry was posted in illustration, juvenilia, Poetry translation and tagged Charles Baudelaire, Evening Harmony, Harmonie du soir, pantoum, translation. Bookmark the permalink.